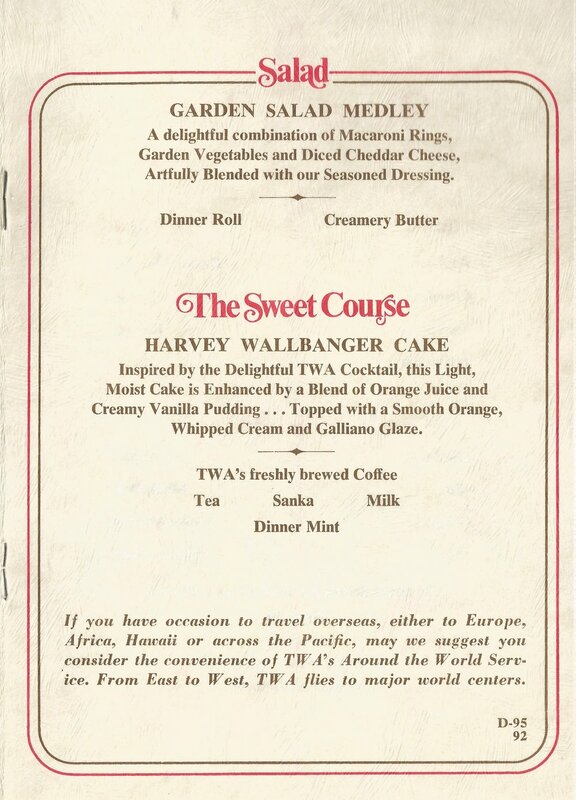 VINTAGE AIRLINE MENU // HARVEY WALLBANGER CAKE — potato chips are not dinner. When I confront my mother about allowing me to booze it up as a kindergartener, her only response is that I "turned out fine!". Debatable. Serve to children with caution. 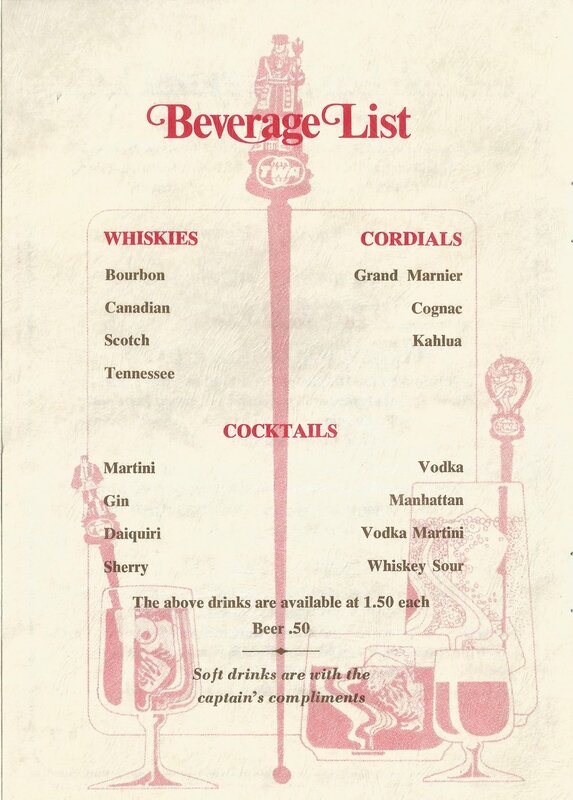 I've added yet another vintage airline menu to my collection (you can read my last vintage airline menu recipe post HERE), this time one from TWA (Trans World Airlines) destination: Madrid in the 1970's. I was pretty sure I was the only person fascinated by these vintage menus, but I got a lot of postitive emails in response to my last post so now I know there are for sure other aviation nerds out there reading this (and they are most likely my airline co-workers and I am kind of worried about getting into eBay bidding wars with them now. Hi!) Don't you think airlines should bring this kind of destination art back ? Flamenco dancer, architecture, a dramatic dance scene, all happening inside of a big head of hair. I love it. When I saw my favorite childhood (!) Harvey Wallbanger cake on this menu I knew I had to re-create it. The Harvey Wallbanger is a cake based on a very popular cocktail from the 60s and 70s that is made with orange juice, vodka, and Galliano liquor. Galliano is a sweet and woodsy herbal Italian liqueur with notes of vanilla and anise. The cake has all of the same flavors as the cocktail, but in a buttery and sweet bundt-cake format. I went full-on retro for this recipe using (shriek!) boxed cake mix and vanilla instant pudding powder, so look away if preservatives scare you. 1. Preheat oven to 350 degrees and grease and flour your bundt pan. 2. Whisk together cake and pudding mix, then add in eggs, oil, Galliano, vodka, orange juice, and orange extract and stif until combined. 3. Bake for 35 minutes or until a deep golden brown in color. 4. While the cake is baking, prepare your icing by whisking together the Galliano, vodka, orange juice and orange extract. Sift in the powdered sugar and mix until there are no more lumps left. 5. Let cake cool just until the pan is cool enough to touch, then you'll want to glaze it with the icing while the cake is still slightly warm. This allows the cake to absorb the icing. 6. Garnish the cake with fresh orange slices if you like, and try not to get any babies drunk with it.